Ming-Li wants to be a farmer, but no one takes such a small girl seriously. When everyone in her village sets out to drive the sparrows from the land, blaming them for eating too much seed, she decides to take a stand to save some birds. In the end, she proves she has the spirit and wisdom to be a true farmer. "In 1958, Chairman Mao declared war on sparrows. He blamed them for devouring the nation's wheat crop, and he required all citizens, armed with pots and pans and firecrackers, to take to the streets and literally scare the birds to death. The successful campaign brought on a plague of locusts and a three-year famine that resulted in the deaths of almost 40 million Chinese. 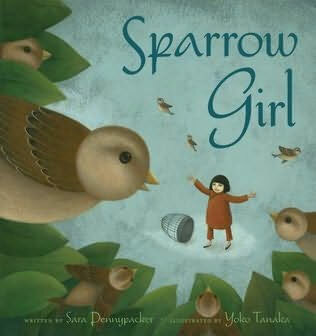 The author takes these actual events as inspiration for a resonant, contemporary fable about Ming-Li, a girl who feels for the sparrows under attack, defies the leader, and rescues seven birds as they fall from the sky. Pennypacker strikes a suitably moralistic tone and tells her story with rich, descriptive detail. Tanaka matches the somber elegance of the text with opaque, folk-inspired paintings in a subdued palette. An author's note explains the difficult facts behind the story. Opposite the grave historical account, though, is an uplifting image: on a field of white, a small nest with seven eggs promises the hope that springs from the simple actions of one empathetic heart. Grades K-3." Thom Barthelmess for Booklist.